Luke Shaw is set to remain at Old Trafford at least until the summer, according to reports. The 22-year-old’s contract with United expires in June, and with his future up in the air, several newspapers suggested that the youngster could be on his way out of the club after a frustrating four-year spell at Old Trafford. However, a number of injuries at left-back have seen Shaw get a lot more game time in recent weeks, and he has put up solid performances on a consistent basis. His form of late has forced Jose Mourinho to reconsider the defender’s future at the club, and the Portuguese tactician might just opt to keep the youngster on. Shaw’s contract has an option to make him sign on for another year, and United appear set to take up that option before they fully decided what to do with the Englishman. 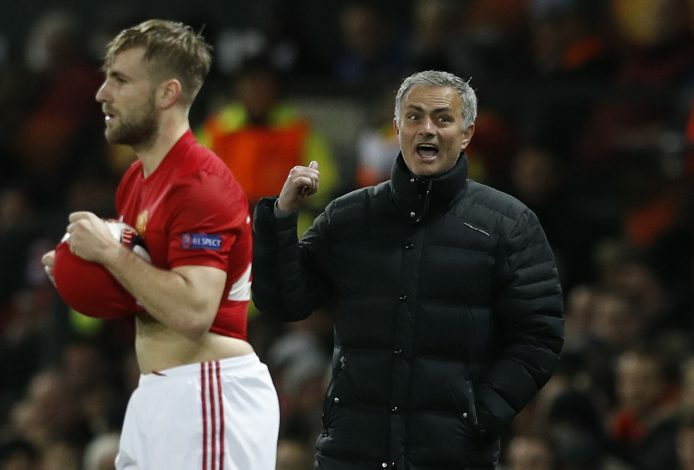 According to Mirror Sport, Mourinho had a short chat with Shaw in the team hotel recently, seeking assurances as to whether the full-back could be relied upon. The answer was affirmative, which is no surprise given the fact that the young starlet has been doing everything possible to convince his manager that he is worthy of a place in his plans. With Ashley Young now facing a ban, Shaw will be given more chances to prove his worth, and he is aware that he has to make the most of this chance now, or face being a casualty once Mourinho begins his clear out in the summer. With Danny Rose set to be made a priority signing at the end of the season, Shaw could be kept as a solid back-up. However, his future completely depends on what he does in the upcoming games, and whether he is able to convince the manager that he is good enough.